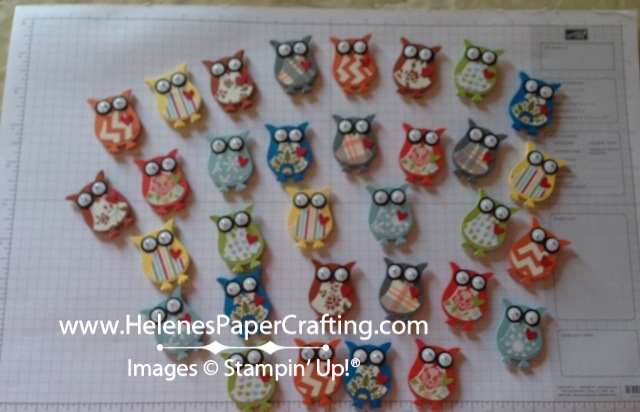 Helene's Papercrafting Helene's Papercrafting: Now That's a Lot of Owls! Now That's a Lot of Owls! 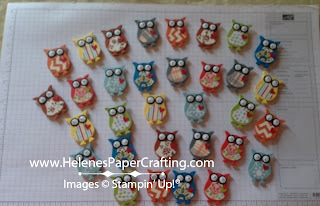 My daughter, Rebecca, came to visit me for Christmas and we had so much fun making these owls magnets for her friends. Each friend will get eight owls or a "parliment" of owls. Yes, that's what a group of owls are called! We used the Owl Punch (item#118074) along with a variety of colors of card stock and coordinating Designer Series Papers and googlies eyes (item# 127539) to make these colorful and fun magnets. This is a great project for using all those scrap pieces of paper you have hanging around. Once the magnets were made, we put eight into a cellobag (item #102757) and tied them with ribbon. This is one of my favorite projects to make and a fun gift to receive.